Last night we arrived at the West Flower Garden Bank about 7:30 p.m., and the Sonsub crew launched the ROV (remotely operated vehicle) almost immediately. 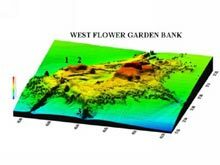 Two transect surveys were conducted at the westernmost region of the West Flower Garden Bank, called the western mound (numbers 1 and 2 in Figure 1, below, indicate the two survey areas). Sonsub technicians Maurice Rivard and Keith Hyatt check the winch controls during a launch of the Innovator ROV. Click image for larger view. Figure 1. Oblique view of West Flower Garden Bank, looking northward. Vertical exaggeration is 12 times normal topography. The numbers 1, 2, and 3 refer to the three sites surveyed during this cruise. Click image for larger view. The western mound is a relatively shallow area (less than 100 m) featuring a wide variety of algal species, and many areas of the sea floor were literally covered with algal nodules. Also called rhodoliths, these spherical nodules consist of carbonate sand and gravel particles cemented together by coralline algae. The nodules range from 1-20 cm in diameter, and are the dominant sediment formers at depths of 45-75 m in the Flower Garden Banks. They remain as free-moving bodies on the sea floor, and can cover anywhere from 60 to 100 percent of the bottom. Rhodoliths serve as the main substrate for leafy algae. 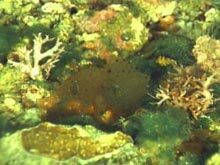 Both light and substrate are necessary for leafy seaweeds to grow. The ROV dives here will provide a wide variety of algal specimens to team member Suzanne Fredericq, a phycologist from the University of Louisiana at Lafayette. After cataloguing and preserving the specimens collected at the western mound, Dr. Fredericq determined that at least two species in her bountiful collection are currently undescribed. For her, the two specimens made the entire cruise worthwhile (see How do we identify seaweeds? below). Coralline algal nodules (rhodoliths) cover the sea floor at the western mound of the WFGB. These rhodoliths support the great diversity of leafy algae seen in this photo, such as the lime-encrusting red alga, Titanophora encrustans, flanking Kallymenia westii (center), the turf-forming green alga Cladophoropsis membranacea, and the green, ball-like Ventricaria ventricosa. Click image for larger view. Coralline algal nodules collected at the western mound with their associated algal partners and a few corals. Click image for larger view. Diverse assemblages of fishes, corals, and invertebrates also inhabit this region, and the Flower Garden Banks National Marine Sanctuary science team directed the Sonsub ROV pilot to collect a wide variety of representative organisms such as corals, invertebrates, sponges, algae, and even a few fish. This bucket of marine sponges was collected during a single ROV dive at the West Flower Garden Bank. Nine different types of sponges were collected, and will be identified later using microscopic techniques. Click image for larger view. This delicate juvenile sea star, Coronaster briareus, is only 2 inches in diameter, but can grow to almost 12 inches. One of the fastest-moving sea stars, this creature has a rather creepy defense mechanism. It can defend itself by allowing its legs to fall off, but can later regenerate any lost limbs. Click image for larger view. At 5:45 am this morning, the ROV went back in the water at the "southern bump" location of the West Flower Garden Bank (site 3 on Fig. 1), and had to come out of the water at 11 am because, as predicted, the weather had turned and the seas got rough and high. 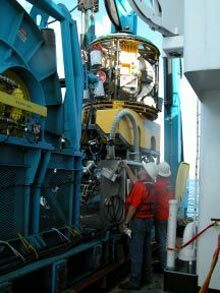 The lead scientists made the decision to start heading east, slowly acquiring multibeam data along the continental shelf edge, heading toward the final deep coral research site off the coast of Mississippi. The weather will be evaluated regularly to determine whether the ROV can return to the water sometime tomorrow. In the meantime, we have secured the equipment and are hunkered down for a rough ride! How do we identify seaweeds? 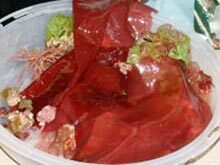 It is well known that seaweeds, especially the beautiful red algae, are notorious for being difficult or impossible to identify when certain reproductive structures are lacking. The result is that many checklists lack the appropriate data to confidently assign specimens to a certain species. Thus, there is a great need to identify nonreproductive specimens that lack diagnostic characters by other means. In most cases, vegetative and reproductive structures need to be sectioned by hand with a razor blade (Fig. 1). The sections are then placed on a glass slide, stained, covered by a cover slip, and observed with the light microscope (Fig. 2). The samples needed for further morphological studies are typically fixed and wet-preserved in diluted (5 to 10 percent) Formalin/seawater and stored in bottles, or freshly pressed on herbarium sheets (Fig. 3). Specimens are then deposited in herbaria -- depositories of plant specimens -- where researchers can study and compare particular collections with specimens from other parts of the world (Fig. 6). While few may think to do it, pressed seaweeds also make beautiful and original Christmas cards! Fig. 1. Because many seaweeds look superficially similar, sections are made through vegetative and reproductive structures for a correct identification. Click image for larger view. Fig. 2. 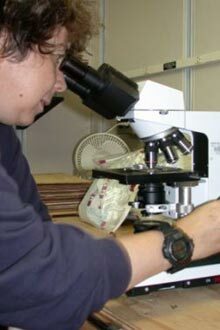 Suzanne Fredericq, a phycologist at the University of Louisiana at Lafayette, views seaweed sections under the light microscope. Click image for larger view. One successful approach to help characterize and explain the relationships and distributions of seaweeds is the comparative analysis of their DNA sequences. A small DNA component of one species is compared with that from a number of other species in other parts of the world. Specimens for molecular studies are typically preserved in Ziploc bags in silica gel, the crystals used to dry flowers that are commonly found in hobby stores (Fig. 4). The silica gel removes most of the liquid in a sample but preserves the DNA. Back in the laboratory, total DNA is then extracted from representative specimens, and a suitable molecular marker is selected that will provide the appropriate phylogenetic (evolutionary) signal for addressing particular taxonomic and biogeographic (distributional) questions, such as: "what are the closest living relatives of seaweeds under study and in which group do they belong", or "where did the marine flora present in the Northwestern Gulf of Mexico come from"? Some exciting results from this cruise already include a new species of the red algal family Nemastomataceae, and an unknown species of Halymenia (see Figure 3). Just collecting these two specimens makes the whole trip worthwhile. Fig. 3. 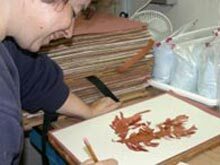 Seaweeds are pressed on herbarium sheets for further study and repository in botanical herbaria. The species that Dr. Suzanne Fredericq is pressing was found at about 66 m depth (200 ft) in the West Flower Garden Banks, and represents a new depth record for a seaweed in the Gulf of Mexico. Click image for larger view. Fig. 4. 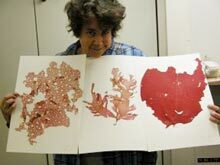 Dr. Fredericq holds a herbarium sheet with the pressed red algae found at 200 m. From left to right are Kallymenia westii, a new species of the Nemastomataceae, and an unknown species of Halymenia. The Northwestern Gulf of Mexico is remarkably rich in seaweed diversity. Click image for larger view. One goal we wish to accomplish during this exploratory trip is to identify and characterize the seaweeds, and assess the degree of their uniqueness, in each of the deep banks surveyed (Alderdice, McGrail, Rankin, Bright, Geyer, West Flower Garden). Seaweeds play a crucial role in our ability to assess the health of the deep banks, regulate species introductions, and monitor harmful algal blooms or global change. Thus, they need to be accurately characterized, and short- and long-term trends in the diversity of their assemblages must be thoroughly investigated. Fig. 5. Dr. Fredericq preserves a specimen in silica gel for molecular examination. Click image for larger view. Fig. 6. Deep-water seaweeds that need to be correctly identified and characterized. Click image for larger view. In addition to clarifying distribution ranges of known species, our exploratory collecting efforts in these unique but poorly sampled benthic environments of the Northwestern Gulf of Mexico will lead to the discovery of more species new to science.